One week from today, team Ram Nation will tip off for their 3rd year in a row, taking part in The Basketball Tournament. After starting the last two years tournaments in Charlotte, NC, team Ram Nation is lucky enough to play in a familiar place, the Siegel Center. Team Ram Nation will play on Saturday, July 14th at 8pm. You can purchase tickets here. The roster is an all-star line up of your favorite VCU players in recent history, B. A. Walker, Jamal Shuler, Jordan and Bradford Burgess, Brandon Rozzell, Darius Theus, Eric Maynor, Melvin Johnson, Juvonte Reddic, Jesse Pellet-Rosa, Justin Tuoyo, and Reggie Williams (VMI). Joining the team this year are James Farr (Xavier), Zeke Marshall (Akron) and Ryan Richards. Team Ram Nation is put together by general manager Mat Shelton-Eide and led by coach Joey Rodriguez and assistant coach Corey Coffer. 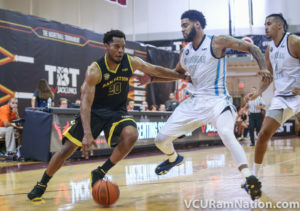 Last year, team Ram Nation made it to the elite 8 before losing to Overseas Elite. Here are just a few highlights from last years tournament. You can view the full TBT schedule of games here. Great team. One of the best. I am fan of this team.